Forgive and… what was I saying? Forgiveness is a practice that very few people have mastered. It isn’t that we live in a society of self indulgent and self centered… um… ok, maybe we have failed as a culture to truly practice altruism and instead have encouraged the “Me” generations to continue focusing on self to the exclusion of behaving with kindness and understanding to the people for whom we allegedly have affection or even care. 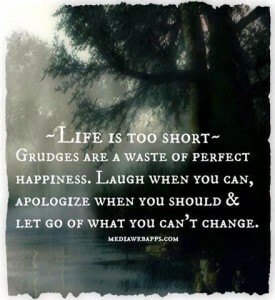 All that being said, forgiveness is something that we do when we let go and pardon some wrong done to us. That’s all. Unfortunately, many of us get caught in the cycle of something less healthy. Unable to let go of the idea of vindication rather than true forgiveness. That attachment to vindication leads us to use the concept of forgiveness to succor a sense of superiority to those we feel have wronged us. When I was younger, I can remember people telling me to “let it go” whenever I was upset or angry about something that I felt was done wrong to me. In fact, my mother at one point begged me to stop talking about some of the difficult times I had experienced. She said that in talking about it, I seemed to just be making things worse and exacerbating my own pain. This was a complete contradiction of all I had been encouraged to think and believe in various counseling and psychology courses. My instructors and the long history of medical and psychological development had led me to believe that the way to resolve ill feelings and emotional conflict would be to experience catharsis through the sharing of narrative: In short, talking it out. So, following the dictates of my intellect, I attempted to gain some sort of relief of hurt feelings and psychic pain through telling… and retelling… and yes, retelling the ways in which I had been wronged by various people throughout my life. I thought that I was verbally getting it out of my system. For years, I continued to rehash old slights and new to the sympathetic ears of friends or family. And yet, I never felt any better. The old wounds ached (like an old warrior when the weather changes). They still seemed, at times, as fresh as they had been when initially inflicted. So, my self-imposed “talk therapy” wasn’t working. So, why didn’t work? It finally broke through the hard shell of my cranium that perhaps the people telling me to “let it go” were correct. Maybe my mum had been in the right. Every time that I retold the painful conflicts and injuries suffered in the past, I was scratching off the scabs to reopen the wounds and prevent them from healing. I decided to experiment with the idea of letting go. I verbally forgave the offenders of my life. Sometimes I did it in person. Sometimes, when it wasn’t possible, I just stated it out loud to the empty air. It still wasn’t quite doing it. It was a few more drops of water under the bridge before the epiphany occurred. Forgiveness is only half of the equation. That old chestnut about forgiving and forgetting? It isn’t just a platitude. The forgetting bit is a significant part of the success in healing. I’ve seen it over and over. People trying to apologize while justifying the behaviors for which they are offering apology, and others forgiving while rubbing the past faults of the forgiven in their faces. This violates the basic principles of forgiveness and of true and appropriate remorse. I’m still as guilty of the fault as anyone. Knowing isn’t even half the battle. It is still too much a part of human nature to want to be right, even when it feels wrong. Not every action that wounds you will gain an apology; and while forgiveness may relieve the conscience of the apologizer when there is remorse, forgiveness is more important for the future focus of the person forgiving. You can’t move forward, without letting go of the past, it is too easy to hang onto the pain and anger of being wronged when you keep the memory of the details too fresh in your mind. Yes, our experiences make us who we are, but hanging onto the past lets the past hang onto us. We remain stuck in time and fail to move into the future. When forgiveness is the chosen path, look forward, not back. Keep the eyes focused forward and it is less likely that obstacles will trip you up or that you will end up going the wrong way. It’s hard to see a way forward if you only look into a rearview mirror.